The increase in the East End's Jewish population in the 1880's coincided with a trade slump that led to mass unemployment. The Jewish immigrants found themselves accused of taking English jobs and English homes. As a consequence it was a widely held belief that the murderer resided in this community. The people who lived in the area comprised a cross section of the lower stratum of Victorian society. The 19th century had seen a steady flow of economic migrants drifting into London from the region of East Anglia. Essex, which had been decimated by the decline of its cloth and farming industries, and which was one of the poorest counties in England, noted for its huge number of workhouses, had seen a huge migration of its surplus population into East London. Irish immigrants had started arriving with the potato famines of 1846 and later. Many of these were reluctant immigrants who had not wanted to end up amidst the squalor of East London, but had ended up marooned there when their attempts to find ultimate redemption in America had failed. They settled into areas around the riverside, and made their living by their physical strength, the majority of them finding work in the docks. They were not particularly well liked and violence amongst this section of the East End community, especially when drunk, was commonplace. By far the largest immigration into the East End had been that of the Jews who had begun arriving in increasing numbers from 1881 onwards as they fled persecution or economic hardship in Russia, Poland and Germany. By 1888 the Jewish Population of Whitechapel had grown to between 45,000 and 50,000. 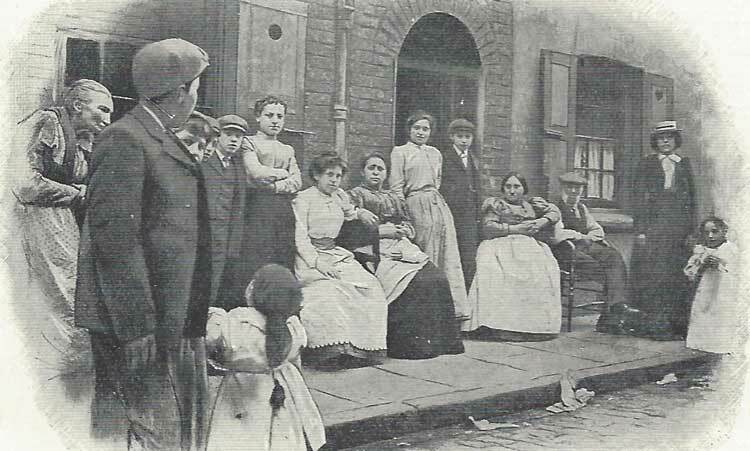 At first these Jewish immigrants had settled into the streets to the south of Spitalfields. At first the Jewish immigrants were received with a certain amount of sympathy. But as the decade wore on, and an economic depression saw the spectre of mass unemployment sweep across the East End, attitudes began to change. In February 1886 The Pall Mall Gazette had warned its readers that "the foreign Jews of no nationality whatever are becoming a pest and a menace to the poor native born East Ender." By 1888, high local unemployment, combined with an acute housing shortage in the East End, had focused national attention on the immigrant problem, and two Select committees were formed to look into it. The first in the House of Commons met between 27th July and the 8th August, and focused on alien immigration. The other met in the House of Lords and investigated the so-called Sweating system in the East End, whereby employees crammed into often tiny, stinking and unwholesome workshops, would work anything up to twenty hours a day for wages that amounted to little more than a pittance. This was seen as being particularly prevalent amongst the newly arrived Jewish immigrants, or "greenies,", many of whom also slept in the rooms in which they worked. White's prejudices were debunked by several prominent Anglo-Jewish M.P's - most notably East End M.P. Samuel Montagu - but White was reflecting sentiments and prejudices that, by the middle of 1888, were held by large numbers of East End residents. The Committee was then addressed by Charles Freak, Secretary of the Shoemaker Society, a trade that was synonymous with Whitechapel who let loose a nasty little piece of xenophobia. He went on to accuse the Jewish immigrants of frustrating English workmen in their battle to attain higher wages by blacklegging during disputes and taking "work out at any price." Gentile hostility was bad enough, but the immigrants were also criticised by fellow Jews, including Henry de Jonge, an English Jew of Dutch descent, who despite being retained as Yiddish interpreter and legal adviser for the aliens, felt compelled to enlighten the committee about populist gentile views and prejudices against the Jews. They had, he claimed, displaced native tradesmen who were now only able to gain "a precarious living compared with what they were in the habit of getting." By way of illustration he explained how "wages in tailoring, shoemaking and cabinet making, which had once stood at £2 a week, had now dropped by half to £1 and £1 5s." The committees would ultimately vindicate the immigrants, but their prolonged deliberations ensured that the matter was in the public eye throughout the first eight months of 1888. The East London Advertiser kept a wary and critical watch on the immigrant problem throughout the year lamenting on the 30th June that the local poor were hard driven with high rents and the competition from "foreign Jews." In her book Out of Work , John Law - aka Margaret Harkness - had the wife of a radical carpenter express the sentiments of many in the East End of London. One fact that went un-noticed, or at least un-remarked on, by the alienists and the more xenophobic elements of the press, was the fact that by and large when the Jewish immigrants moved into a neighbourhood they tended to have a remarkably civilising effect on their surroundings. Social workers, reformers and even the police were quick to observe how an influx of Jews into a particular neighbourhood would soon raise the standards and behaviour in some of the worst parts of London. Streets and blocks, notorious for violence and crime, became comparatively well behaved after Jewish families moved in. However, this was not a view shared by a large number of East End inhabitants, and the significance of the spotlight being turned on the Jewish immigrants throughout the first half of 1888 was that, by the end of the summer, many in the neighbourhood genuinely believed that the Jews were capable of anything. So, when the Whitechapel murders confronted the East End of London with a new type of crime, unprecedented in its barbarity, the gentile population were only too willing to blame the murders on the immigrant community. Spurred on by press xenophobia they came to the conclusion that an Englishman could not be responsible, and were more than happy to seek vengeance against the community that had already become their scapegoats for virtually all the other ills that blighted their every day lives.